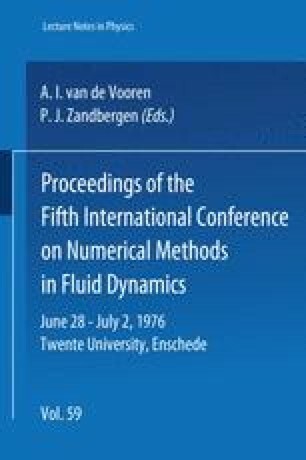 A numerical procedure has been described for unsteady chemically reacting flowfields where vastly different time scales can be applied to the fluids and chemistry thereby providing for efficient computation. The fluids operator correctly models the convection with explicit differences, while the split reaction terms can be solved by an O. D. E. technique best suited to its particular problem. A major difficulty with numerically “capturing” shocks has been identified for reacting flowfields where the chemical rate terms are strongly dependent upon local temperature. A shock-fitting procedure was demonstrated which alleviates this problem and has proven to work well in a series of severe tests of the procedure. All of the numerical procedures discussed have potential for application to multi-dimensional problems and complex reaction schemes.